Sport and RPG elements have been combined with traditional fighting game mechanics for the first time, to offer unrivaled realism and challengingly brutal gameplay. Train until you sweat blood to increase skills such as endurance, speed, leg and arm strength. When you think your ready, take part in underground street fights for cold, hard cash. Strive to earn the right to call yourself…the most powerful Capoeira fighter in the World! Martial Arts: Capoeira, is based on Capoeira, a Brazilian martial arts. Capoeira is a Brazilian fight-dance, game, and martial art created by enslaved Africans during the 16th Century. Participants form a roda (circle) and take turns playing instruments, singing, and sparring in pairs in the centre of Martial Arts: Capoeira. The game is marked by fluid acrobatic play, feints, subterfuge, and extensive use of groundwork, as well as sweeps, kicks, and headbutts. Technique and strategy are the key elements to playing a good game. 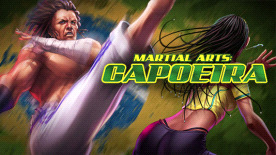 Martial Arts: Capoeira is at his base a classical beat’em up, but with a strong influence from RPG games where you can enhance and personalize the fighters. You will always face new challenges and new experience, as every time you create a new Career mode session, you have the opportunity to chose different approach and strategies, spreading skill points differently and challenging tournaments in different ways.